Notes: Dave Whitlock popularized this pattern for bass fishing in his home waters of Oklahoma. There are many variations to this fly. Some tiers, such as Chris Helm, use variations on the color of the deer hair, spin the hair, and trim for effect. 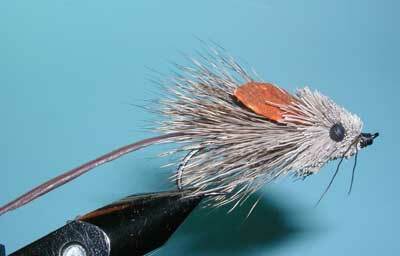 Dave's fly is much simpler yet still effective. The body of the mouse uses the hair tips with a hair stacking method whereas the head utilizes a spinning technique. Under weedy conditions, Dave will also put on a monofilament weedguard by attaching the mono to the bend of the hook and fastening it to just behind the eye after the mouse body has been completed.